Also, Symphony No. 7. Rudolf Firkusny, piano; William Steinberg, Pittsburgh Symphony Orchestra. EMI CDM 7243-66888-2-7. Some of the best releases from the major classical record labels have been old reissues. And why not? Classics have endured the test of time. Many of them have become old friends, and it's nice to see them freshened up and repackaged. 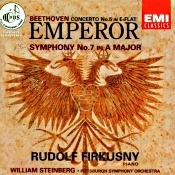 For example, the disc on hand: Beethoven's "Emperor" Concerto in the hands of Czech-born American pianist Rudolf Firkusny (1912-1994) fairly crackles with energy. Firkusny avoids excesses, indulging in little of the bravura we hear from Vladimir Ashkenazy (London), the nuance of Stephen Kovacevich (Philips), or the lyrical poetry of Wilhelm Kempff (DG), yet offering a performance of great strength and precision. Above all, it is Firkusny's crispness of attack that sets the interpretation apart. He appears to know exactly what he wants, and he gets it done with the least amount of fuss or bother. What's more, conductor William Steinberg obviously understands this approach and matches it perfectly with his Pittsburgh Symphony accompaniment. The companion piece, Beethoven's Symphony No. 7, is likewise full of crisp energy. It dances along in the first movement and then proceeds most naturally to the gravity of the Allegretto. The Presto has requisite zip, and the Finale soars in a more than matter-of-fact way. Steinberg's reading hasn't perhaps the energy of a Fritz Reiner (RCA/JVC), the lyricism of a Colin Davis (EMI), or the directness of a Carlos Kleiber (DG), but it carries a good tune. EMI digitally remastered both pieces from original session tapes made in March and October of 1957 in what EMI called at the time FDS, "Full Dimensional Sound." Although the sound is strong on midrange, it's not particularly weighty in bass. Highs are not terribly smooth or extended, either, but, like the rest of the sonic image, they are clear and well defined. The piano sound is especially noteworthy for its clarity and articulation. There is some inevitable tape hiss noticeable in the quietest passages that should not be a concern except to those who place digital silence above everything else. The disc makes an easy recommendation for its performances, with only minor hesitations about the decades-old remastered sonics. An American in London. Shelly Berg, piano; various featured artists; Jose Serebrier, Royal Philharmonic Orchestra. Decca Gold B0028889-02. 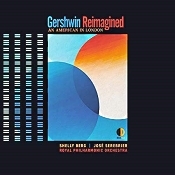 The idea of combining jazz artists with a symphony orchestra is hardly new; after all, pop composer George Gershwin (1898-1937) wrote Rhapsody in Blue in 1924 originally for solo piano and jazz band, and it wasn't rescored for orchestra (theatrical and symphony) by Ferde Grofe until several years thereafter. As a result, we have in the record catalogue any number of fine discs by various ensembles, large and small, from duets to full orchestra. 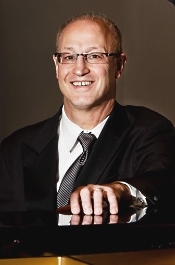 On the present album, we find American pianist, arranger, and orchestrator Shelly Berg (b. 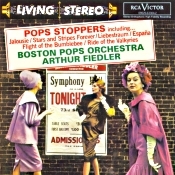 1955), his trio, and various other artists doing Berg's own jazz interpolations with the Royal Philharmonic Orchestra under the direction of Jose Serebrier. The results are every bit as satisfying as I would imagine Gershwin intended--jazzy, swinging, rhythmic, rhapsodic, and lush. Considering the talents involved, it's the kind of album that's almost self-recommending. The first two items on the program are the longest: Rhapsody in Blue (23:31 min. ), featuring the Shelly Berg Trio in original jazz variations and the RPO and An American in Paris/Home Blues (21:24 min. ), featuring American R&B and jazz artist Ledisi Anibade Young and the orchestra. After those tracks are four shorter items: "I Loves You Porgy/My Man's Gone Now" from Porgy and Bess, featuring American singer (and daughter of composer Henry Mancini) Monica Mancini and Cuban-American jazz trumpeter, pianist, and composer Arturo Sandoval and orchestra. Next is "Fascinating Rhythm," featuring American violinist Mark O'Connor and orchestra. After that we find "Three Preludes," with Serebrier and the orchestra. Then the album concludes with "I Got Rhythm," featuring the Shelly Berg Trio and orchestra. Since Rhapsody in Blue is the most prominent piece in the collection and since it represents the best of the selections, let's take a look at it in particular. Serebreir's accompaniment of the piano is nicely jazzy and bluesy, with solid rhythms. He is able to generate a good deal of excitement with his interpretation. Likewise, Shelly Berg's piano solos are lively and invigorating on the one hand, lyrical and introspective on the other. The difference, of course, is that a few minutes into the piece, Berg and his trio go into their own variations and kind of leave Gershwin behind for intervals. It's not at all inappropriate, and I'm sure if Gershwin were alive he would approve. In fact, it gives the old warhorse a new look. So, for most folks who already own multiple versions of the music, this one should provide some much-needed variety in their collection. For what it's worth, I enjoyed An American in Paris best of all, with Ledisi singing Gershwin's lyrics to the familiar "Home Blues" section. The whole thing is delightfully done and a real charmer. The other soloists are equally spirited and heartfelt by turns for a rewarding whole. So, all the tracks work well. Overall, they're fairly conventional, except for their new additions, yet they're polished, innovative, and extremely well performed. Obviously, these arrangements would not be first-choice recommendations for people looking for a one and only recording of Gershwin standards. They are for people who already have favorites and want to supplement them. The booklet notes, incidentally, contain a good deal of information on the artists involved in the production but almost no info on the music. I suppose the folks at Decca think we already know enough about Gershwin and his tunes that they didn't need to add anything more. Fair enough. Producer Gregg Field and engineer Mike Hatch recorded the music at Air Lyndhurst Studios and Henry Wood Hall, London, releasing the album in 2018. The sound is pretty much in the long-established tradition of Decca stereo recordings. It's very clear and clean, and it has a healthy dynamic range. But it also appears multimiked, with the soloists clearly out in front, and the orchestra taking a literal backseat. It's not at all unpleasant or distracting, just a little different from what you might hear in a concert hall. Indeed, once you get used to it, it is quite entertaining, especially the clarity. 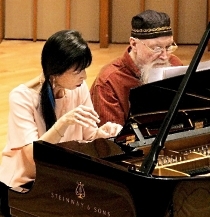 Other Minds launches its 2018-2019 25th anniversary season on Wednesday, December 5, 7:30 p.m. at Yerba Buena Center for the Arts Forum with an evening recital showcasing the piano works of Terry Riley. The composer himself will perform a selection of his semi-improvised solo piano works including Simply M and Requiem for Wally, with longtime collaborator and GRAMMY Award-winning pianist Gloria Cheng performing The Heaven Ladder, Book 7, The Walrus in Memoriam and Two Pieces for Piano. Riley and Cheng will conclude the program by joining forces for the Bay Area Premiere of Cheng Tiger Growl Roar, a new four-hand work composed for the pair. Wednesday, December 5, 2018, 7:30 p.m.
Over a career spanning six decades, Terry Riley has influenced countless classical artists as well as those from the jazz, rock and electronic scenes. 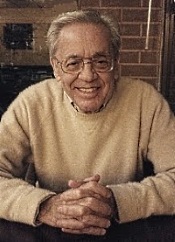 His seminal 1964 work In C is widely considered to be the first minimalist composition and had a profound effect on the evolution of 20th century classical music. 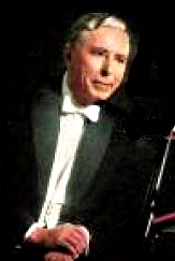 Demonstrating his trademark improvisational approach, Riley will appear as soloist for two of his piano works written for mentors that had a significant impact on his career: Requiem for Wally, in memory of his close friend and teacher, the American ragtime pianist Wally Rose (1989) and Simply M (2007), written in memory of Margaret Lyon, chair of the Mills College music department. Tickets range in price from $35 and $45, and can be purchased through http://www.ybca.org or by phone at 415-978-2787. $15 student tickets can be purchased in-person with valid student ID. On December 8th at the Maison Symphonique, Jean-François Rivest and Walter Boudreau will share the stage to conduct the Orchestre de l'Université de Montréal (OUM) in a major concert, presented by the SMCQ and the Faculté de musique de l'Université de Montréal. The concert will also showcase the talents of young dancers from the École supérieure de ballet du Québec. Between Cendrillon, Prokofiev's mythical ballet, and the fourth section of Boudreau's Berliner Momente, strongly inspired by famous works from Haydn and Wagner, the two conductors will present orchestral music that is simultaneously avant-garde and in the symphonic traditional style. The program, which will bring together 100 musicians and dancers, will be rounded out by an original work from young composer Keiko Devaux, winner of the "Concours de composition de l'OUM", À perte de vue… . And Jeunesses Musicales Canada (JMC) also invites music lovers to their Happy Hour Concerts, a golden opportunity to hear the best emerging artists in the classical world in a casual atmosphere, while sipping on a glass of wine after work. Treefort Music Fest is an annual music and arts festival featuring over 400 bands plus film, art, comedy, yoga, and more across multiple venues in downtown Boise, Idaho in March. Now in its eighth year and set for March 20-24th, Treefort Music Fest is excited to announce its first round of performers, which includes Liz Phair, Toro Y Moi, Angelique Kidjo's Remain In Light, Black Mountain, Dan Deacon, Black Moth Super Rainbow, Laura Veirs, Y La Bamba, Rituals of Mine, Rubblebucket, and more. Be on the lookout for the second wave of artist announcements next month! With the first artist announcement comes the release of the first official Treefort Music Fest 2019 playlists, which can be found on Spotify, Soundcloud and Apple Music. Young People's Chorus of New York City (YPC) celebrates the holidays with a variety of performances around the city, including its "Winter Wonder" concert at Carnegie Hall on Wednesday, December 12 at 7:00 p.m. Led by YPC Founder / Artistic Director Francisco J. Núñez and Associate Artistic Director Elizabeth Núñez, the program features special guest string trio Time for Three. YPC also performs this fall and winter at the Metropolitan Museum of Art, St. Patrick's Cathedral, Lincoln Square, and the Church of the Intercession, as well as in televised appearances on "The Today Show" and at the Macy's Thanksgiving Day Parade. For complete information, visit ypc.org. "Until you've heard Martin Fröst, you really haven't heard the clarinet" claims The Times (London) – and Princeton University Concerts is offering one of only two U.S. appearances this season during which audiences can do so. Fröst is a performer who truly transcends his instrument and makes music that simply feels alive, from his riveting on-stage presence (he's been known to dress up like a bird in concert) to his inventive approach to programming...if anyone is going to convert you to the clarinet, it is Fröst. His visit to Princeton University Concerts with pianist Henrik Måwe on Thursday, December 13, 2018 will begin at 12:30PM with a Live Music Meditation, guided by Princeton University Associate Dean of Religious Life Matthew Weiner, in Richardson Auditorium, Alexander Hall. This is a FREE, unticketed opportunity to experience world-class music on an incredibly personal and visceral level while meditating to live music performed by the duo. No experience is necessary. At 8PM in Richardson Auditorium, Alexander Hall, Fröst and Måwe present a recital of works by Francis Poulenc, Antonio Vivaldi, and Johannes Brahms on Princeton University Concerts' 125th anniversary Concert Classics series. At 7PM, students in the Princeton University Clarinet Ensemble, "Anches Cantori," will start the evening off with arrangements of works for multiple clarinets in a tribute to the instrument. This pre-concert event is free to all concert ticket-holders. The Live Music Meditation is free and unticketed. Tickets for the evening concert are $10-$55, available online at princetonuniversityconcerts.org, by phone at 609-258-9220, or in person two hours prior to the concert at the Richardson Auditorium Box Office. In one week, on Saturday December 1st, you are invited to dance to the Nutcracker with a live beautiful symphony orchestra! Because of the nature of this performance, seats are limited. Buy your tickets now. And for our EXO friends, we are offering a 30% discount on the 7:30pm show. Just enter "EXO30" at checkout. In our signature interactive performance of the Nutcracker, we invite you to be transported inside the story of Clara and her Nutcracker Prince, as you'll have the opportunity to dance, drink and be merry at this fully immersive concert. Come at 3:30pm for a family friendly experience, and 7:30pm for adults (with full bar). Take it from our audience last year in this video--dancing to Tchaikovsky's ballet yourself is beautiful and unlike anything else this holiday season. This unique holiday experience will be held at the beautiful Bohemian National Hall, 321 East 73rd Street, NYC, easily accessible to the Q at 72nd Street and 2nd Avenue. 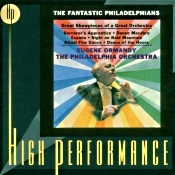 Eugene Ormandy, the Philadelphia Orchestra. RCA High Performance 09026-63313-2. By the late Nineties, the folks at RCA had finally figured out what to do with all those old quadraphonic recordings they made in the early Seventies. If this disc was any indication, they probably thought they could remaster the whole lot of them in Dolby Pro Logic and 24-bit technology and market them in their "High Performance" series. But apparently they thought better of the idea. Although the sonic results here are not bad, they are a far cry from audiophile quality. The disc is filled with showstoppers, things like Saint-Saens's Dance Macabre, Chabrier's Espana, and Falla's Ritual Fire Dance, some of them making a good impression, others not so much. And the sound is equally up and down. The single most outstanding characteristic of the album is the quality of the Philadelphia Orchestra, which sounds wonderfully lush and lustrous. Eugene Ormandy was at the helm of the Philadelphia Orchestra for an amazing forty-four years, yet his catalogue of recordings restored to CD remains relatively meager, especially his output for RCA, a little better for Sony (CBS/Columbia). One can understand why, though. He simply did not produce enough critically celebrated albums. OK, I know that statement is not going to go over well with Ormandy's multitude of fans, but unlike some of Ormandy's contemporaries in America during hi-fi's golden age of stereo--Reiner, Fiedler, Bernstein, Solti, et al--Ormandy, with his fairly foursquare rhythms and conservative phrasing, was rather conventional in his approach to music making. These performances demonstrate the fact. They are perfectly acceptable and perfectly ordinary to the last. Which isn't, as I say, bad, just not good enough to endure very well the test of time. RCA's sound, too, has its pluses and minuses. 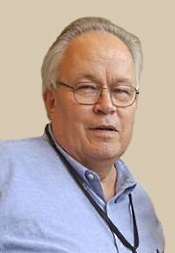 Producer Max Wilcox and engineer Paul Goodman recorded the material in 1971-72, and RCA digitally remastered it in 1998 in 24-bit Dolby Surround. In its favor, it is extremely dynamic, with occasional thunderous lows and clean, clear highs. Counting against these merits are its multi-miked two-dimensionality and its sometimes over-spacious acoustic when played back in regular two-channel stereo. Some of the tracks sound reasonably free of this property--Ponchielli's Dance of the Hours, for instance, and Kabalevsky's Galop, probably the best piece on the disc. Nevertheless, much of the music sounds like it's adjusted to one of those overactive "Stadium" settings that hardly anybody uses on a surround-sound receiver. In short, I wasn't exactly bowled over by Ormandy or his newfound sound of the day. Also, works for cello. Ophelie Gaillard, cello; Julien Masmondet, Czech National Symphony Orchestra. Aparte Music AP174. Quixote. You remember him: the guy with the impossible dream. Long before the stage musical and film Man of La Mancha, Spanish writer Miguel de Cervantes (1547-1616) created Don Quixote, the famous elderly gentleman who fancied himself a knight of high ideals, and his sidekick Sancho Panza. Then came German composer Richard Strauss (1864-1949) with his tone poem describing some of Quixote's adventures. 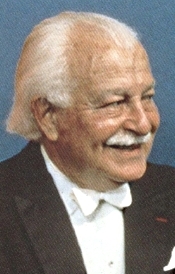 Strauss composed the piece in 1896, just a couple of years after Also Sprach Zarathustra and while he was making a name for himself with his highly descriptive, impressionistic musical sketches. 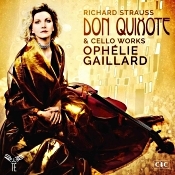 Strauss's Don Quixote is a work for cello, viola, and orchestra. He subtitled it "Phantastische Variationen über ein Thema ritterlichen Charakters" ("Fantastic Variations on a Theme of Knightly Character") and based the music on episodes from Cervantes's novel Don Quixote de la Mancha. Strauss wrote the score in the form of a theme and variations, with a solo cello depicting Don Quixote, and a solo viola, among other instruments, portraying his squire Sancho Panza. Of the ten variations within the piece, perhaps the most famous is the first one, the Don's "Adventures at the Windmill." The second variation, too, is quite evocative, a section in which Quixote encounters a herd of sheep and sees them as an approaching army. Here, Strauss uses a flutter-tonguing in the brass to represent the bleating of the sheep. It's all quite colorful and fun. Of course, the question with any new recording of a well-known and oft-recorded piece of music is how well it compares to older, favored performances. 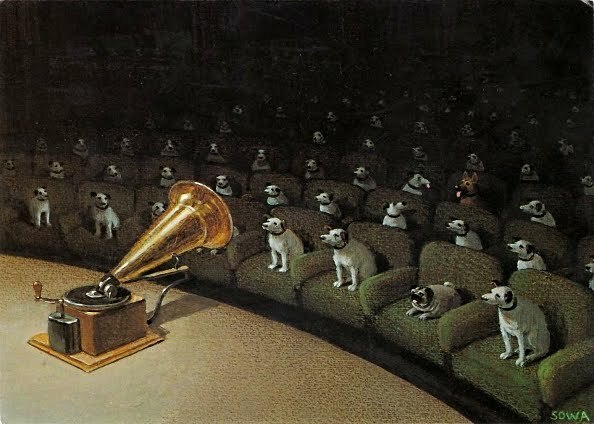 For me, some old favorites would include Herbert von Karajan's lush, ripe presentation with Mstislav Rostropovich and the Berlin Philharmonic (EMI); Rudolf Kempe's leaner, tauter interpretation with Paul Tortelier and the Dresden Staatskapelle (EMI); Fritz Reiner's more energetic reading with Antonio Janigro and the Chicago Symphony Orchestra (RCA); and Andre Previn's better recorded but more straightforward account with Franz Bartolomey the Vienna Philharmonic (Telarc). The answer to whether this new Aparte recording with Maestro Julien Masmondet, Ms. Ophelie Gaillard, and the Czech National Symphony is any better than the rest is a definite sort of, or maybe, or maybe not. The reason I can't be more enthusiastic about the soloist or interpretation is that it never struck me as being as colorful as it could be. Certainly, Ms. Gaillard's playing is technically beyond reproach, as is the violin work by Alexandra Conunova and the expertise of the Czech orchestra. But the performance itself seems rather reticent. I don't hear much of the old Don's eccentricities, and his adventures seem more than a little mundane rather than sad, humorous, peculiar, stimulating, pathetic, satiric, biting, or inspiring. In other words, I wasn't sure just how Ms. Gaillard and company wanted to represent their Quixote. I'm sure Strauss intended his musical depiction of the addled old Don to offer some particular point of view on him without actually specifying that point of view, so the choices of approach are boundless. Nevertheless, under the direction of Masmondet and playing of Gaillard, the music simply appears beautiful and well performed, with a little less in the way of secondary responses than one might expect. Regardless, there's a lot to be said for the beauty of Ms. Gaillard's playing, and the performance makes a charming listening experience. She is especially effectual in the softer, more introspective, more melancholy moments of the score, and one can hardly complain about the serenity of some sections. Coupled with the main tone poem we find three additional Strauss pieces for cello: the Sonata for Cello and Piano, Op. 6, with Vassilis Varvaresos, piano; the Romance for Cello and Orchestra, Op. 13; and "Morgan," the final section of Four Songs, Op. 27, arranged for cello, piano, and soprano, with Beatrice Uria Monzon, soprano. Because Strauss probably didn't mean for the listener to ascribe too much literal meaning to these pieces, I found them more effective as pure music. Artistic Director Nicolas Bartholomee and engineers Nicolas Bartholomee, Maximilien Ciup, and Clement Rousset in conjunction with Little Tribeca recorded the music at the studio of the Czech National Symphony Orchestra, Prague in 2017 and in Paris, January 2018. The sound they obtained is as good as almost anything I've heard for a while. The solo cello is fairly well balanced with the orchestra; the stereo spread is wide; the highs are sparkling; the dynamic range is strong without being overwhelming, and the impact is good. What's more, the clarity and detailing are very fine, indeed. My only minor caveats with the sound are that it's a tad closer than I usually like; it doesn't provide a lot of depth, front-to-back perspective; and there is some spotlighting of instruments, with the cello and violin in particular seeming to move closer to the audience at times and then recede into the distance. Fortunately, these issues are relatively small and should not distract most listeners from enjoying the sonics. The Los Angeles Master Chorale will perform five festive Christmas concerts in Walt Disney Concert Hall in December including a new program called English Cathedral Christmas on December 2 that aims to bring the unbroken advent tradition of British carols and anthems to Walt Disney Concert Hall with works by a range of composers dating from the 16th century to today. The concerts include the popular "Festival of Carols" concerts (December 8 and 15), Handel's Messiah (December 16) and the 38th Annual Messiah Sing-Along (December 17) when the 2,200-strong audience sings as the chorus. Tickets can also be purchased in-person at the Dorothy Chandler Pavilion Box Office Monday – Saturday, 10 AM – 6 PM. 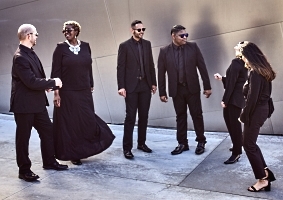 December 15 will see the Nu Deco Ensemble's first concert at The Adrienne Arsht Center for the Performing Arts of Miami-Dade County, Florida in their 2018–19 season, in a soul music-infused program that will center around special collaborations with superstar Macy Gray, R&B singer/songwriter BJ The Chicago Kid, and the Miami Mass Choir. This will be the ensemble's second concert in their fourth season, continuing a commitment to forward-thinking programming and genre-bending performances. Having kicked off their 2018–19 season with a jazz-influenced program in early October, this December concert offers a smooth segue from jazz to soul. Beginning with Bernstein's "Symphonic Dances" from West Side Story, the first half of the program will end with a suite honoring Aretha Franklin, arranged by Nu Deco's Sam Hyken, Aaron Lebos, Armando López, and Jason Matthews. Contemporary R&B stars Macy Gray and BJ The Chicago Kid will join Nu Deco on stage for the second half of the evening, backed by the Miami Mass Choir featuring original works and reimagined arrangements. On the heels of a busy October that included presenting internationally renowned conductor Ivan Fischer leading the Orchestra of the Accademia Teatro Alla Scala as well as the ensemble's own season opening concerts, PUO continues to showcase its vibrant season under the baton of associate conductor Ruth Ochs, standing in for Michael Pratt. The December programs also include Aaron Copland 's Fanfare for the Common Man, Manuel De Falla 's The Three-Cornered Hat Ballet Suite, and will conclude with Claude Debussy's orchestral masterpiece La mer. phone at 609-258-9220, or in person two hours prior to the concert at the Richardson Auditorium Box Office. Salon/Sanctuary Concerts Presents "In the Wake of the Marseillaise"
Songs for soprano and early romantic guitar by Cimarosa, Crescentini, Doisy, Haydn, Domenico Puccini, and Fernando Sor join jewel-like arrangements from the popular operas of the day by Rossini and Halévy, speaking of an age of liberation and a growing taste for bel canto singing. The Young People's Chorus of New York City (YPC) brings together two holiday traditions under the baton of Associate Artistic Director Elizabeth Núñez, who conducts contemporary stagings of Benjamin Britten's Christmas cantata A Ceremony of Carols and Samuel Adler's Hanukkah cantata "The Flames of Freedom" at the Metropolitan Museum of Art on Sunday, December 9 at 3:00 p.m. Heard for the first time in New York City, "The Flames of Freedom" was composed as a musical counterpart to Britten's classic, and both works are explored on the program through sets, lighting, and choreography. This YPC program is one of two performances by the chorus on back-to-back weekends at The Met's Grace Rainey Rogers Auditorium. On Sunday, December 2 at 3:00 p.m., the chorus performs two settings of poetry by Langston Hughes: Ricky Ian Gordon's new choral version of "Litany" and YPC alumna Jessie Montgomery's "Danse Africaine," which was commissioned by the chorus. YPC Founder and Artistic Director Francisco J. Núñez conducts both works as part of "A Dream Deferred: Langston Hughes in Song," a program created by the Museum's 2018–19 Artist-in-Residence, soprano Julia Bullock. Tickets start at $50 for December 2 and $65 for December 9, and are available online at metmuseum.org/tickets or by phone at 212-570-3949. Tickets are $1 for children ages 6 to 16 with the purchase of one adult ticket. For groups of 15 or more, call 212-570-3750. Saturday, December 15, 2018, 1:00 p.m. & 4:00 p.m.
Miller's annual holiday treat returns, a playful production that brings Camille Saint-Saëns's beloved work to life--Carnival of the Animals. A compelling merging of puppets, set design, poetry and music, this production has been described as "enchanting" by The New Yorker and "splendidly witty" by TheaterScene. Audiences will experience magic as everyday objects take on new lives as lions, elephants, and birds, through the incredible vision of director Lake Simons and some of New York's best puppeteers. Saint-Saens's score, performed by a ten-piece onstage chamber orchestra that is "virtuosic, nuanced, and sublime" (ZealNYC), literally comes to life with Lake's puppets. Lucid Culture calls the ensemble's playing "exquisitely detailed" and "unselfconsciously playful." The "sublimely exploratory" (The Chicago Reader) Wet Ink Ensemble teams up with renowned trumpeter/composer and longtime collaborator Peter Evans for an evening of sonic adventure on Saturday, December 1, 2018 at 8:00pm at St. Peter's Church, 346 W 20th St., New York, NY. The concert features a new set of music by Peter Evans with a lineup that Evans describes as "an unholy amalgam of current and closest collaborators in a holiday season blow-out." Performers include 12 musicians from Wet Ink and Being & Becoming (Joel Ross, vibes; Nick Jozwiack, bass and cello; Savannah Grace Harris, drums; Peter Evans, trumpet), with special guests Mazz Swift (violin) and Levy Lorenzo (percussion). Evans writes, "this evening will represent an ongoing process of discovery and collaborative creativity with these players - it is not a culmination of anything. Old and new compositions will be combined together with the improvisational talents of all the musicians, creating an hour-long work tailored specifically for this concert." Tickets are $10 general admission, students free. No pre-orders, cash only at the door. December 1st, 2018 at the Bohemian National Hall, 321 E. 73rd Street, NY, NY 10021. 3:30pm (Kids with Adult Dancing Companions); 7:30pm (Adults only with full cash bar). 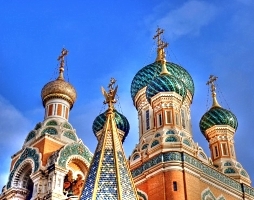 Have you always wanted to dance to Tchaikovsky's Nutcracker with a symphony orchestra? Philharmonic and Metropolitan Opera Orchestra among others). For more information, visit info@experientialorchestra.com. SF Girls Chorus Presents "Holidays at Davies"
San Francisco Girls Chorus (SFGC) presents its annual holiday concert, "Holidays at Davies," on Monday, December 17, 7:30 p.m. at Davies Symphony Hall, San Francisco, CA. A longstanding tradition in the San Francisco Bay Area's holiday concert schedule, the program will build on the success of last year's multi-cultural theme with a variety of traditional and holiday music from around the world. SFGC welcomes frequent collaborators Kronos Quartet for works including the West Coast Premiere of Michael Gordon's Exalted, Alexandra Vrebalov's Missa Supratext, Reena Esmail's Still I Rise, and Stacy Garrop's Glorious Mahalia. Women's choral group Musae also features alongside hundreds of members from six Chorus School levels, SFGC's Premier Ensemble and Alumnae. 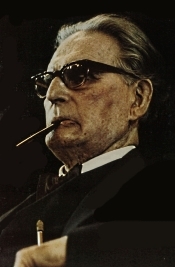 Otto Klemperer, Philharmonia Orchestra. EMI CDM 7243-5-66792-2. 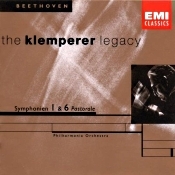 When Klemperer's producer, Walter Legge, asked if he didn't think Klemperer took his recording of the Beethoven Sixth Symphony's scherzo a little too slowly, Klemperer replied, "Walter, you will get used to it." Well, we've had over sixty years to get used to it, and I suspect it has by now pretty much grown on us. Klemperer's performance of the Sixth continues to be one of the most relaxed, leisurely, bucolic interpretations ever put to disc. It has not and will not find favor among the Toscanini crowd, but it has delighted most everyone else since EMI recorded it in 1957. The conductor takes the first movement, "The Arrival in the Country," very deliberately, very purposefully, its repetitions made weightier through its unhurried pace, yet never dragging, never feeling lugubrious. The second movement, "The Scene at the Brook," flows naturally and smoothly, maintaining the easygoing nature of the setting. Then comes Klemperer's famous third movement, usually a quick and boisterous Allegro representing peasant merrymaking, but here taken as though the peasants were more than tipsy when the scherzo started. The storm that follows is weightily structured in big, bold outlines, flowing effortlessly into one of the most joyous "Shepherd's Hymn" in any Sixth interpretation around. This is no namby-pamby performance, but one with a clear and assertive vision of pastoral life. 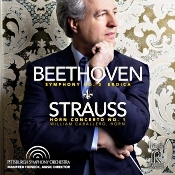 For what it's worth, by the way, I consider it pretty much a toss-up among four classic recordings of the Sixth as to which is my favorite: Karl Bohm and the Vienna Philharmonic (DG); Fritz Reiner and the Chicago Symphony (JVC, HDTT, or RCA); Bruno Walter and the Columbia Symphony Orchestra (Sony, and especially Sony Japan's Blu-Spec CD); and this Klemperer release on EMI. Any time I play any one of them, that one goes to the top of my list, so there's no clear winner for me. My past reservations about the recording (made by producer Walter Legge and engineer Douglas Larter in Kingsway Hall, London) were in regard to the sound of the original LP and the recording's previous CD embodiment, which tended to be somewhat thin, harsh, and noisy. By comparison, this 1998 20-bit remastering, a part of EMI's "Klemperer Legacy" series, is smoother, fuller, and quieter. Nonetheless, the remastering retains a good deal of clarity, sounding more transparent than a lot of new releases. The disc's coupling, Klemperer's recording of the Beethoven First Symphony, seems not nearly so characterful as his Sixth, sounding a little too massive to convey all of the work's good cheer. Nevertheless, it also seems more richly recorded than the Sixth. Go figure. Songs on poems by Emily Dickinson. Lisa Delan, soprano; Lawrence Foster, Orchestre Philharmonique de Marseille. Pentatone PTC 5186 634. American poet Emily Elizabeth Dickinson (1830-1886) was among the country's most unusual artists in that she was almost unknown as a poet in her lifetime. She was withdrawn and reclusive, never married, and allowed the publication of only a handful of her poems while she was alive. After her death, her relatives found a veritable treasure trove of her poems and published many of them. Then, she became quite famous, yet, remarkably, her complete and largely unedited works would not see publication until 1955. Although Ms. Dickinson's poems are most often brief and simple, they contain a wealth of insight. Conciseness is probably the single most important element in her poems, her succinctness in expressing big ideas in a small space. She had the unique ability to condense her observations on Nature, spirituality, consciousness, death, solitude, and essential human emotions like fear, longing, and ambition into just a few lines. It was, perhaps, the breadth of Ms. Dickinson's insights that led a number of composers to set at least some of her poems to music. 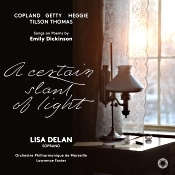 On the present album we find the work of four such composers, Copland, Heggie, Getty, and Tilson Thomas, effectively sung by soprano Lisa Delan, accompanied by conductor Lawrence Foster and the Marseille Philharmonic Orchestra. 5. Dear March, come in! 10. I'm Nobody! Who are you? The earliest of the musical compositions, Aaron Copland's, date from 1948-50; the others from 2001 (Tilson Thomas) to 2014 (Jake Heggie), with Gordon Getty's pieces deriving from 2004. Soprano Lisa Delan provides a lovely presentation of the poems, her voice radiant and expressive. 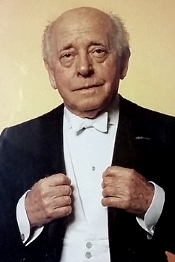 Maestro Foster's accompaniment with the Marseille Orchestra is sweet and sympathetic. One cannot doubt that the album's selections get a treatment the composers would approve. That said, I don't know that I appreciated the music as much as I might. Having practically grown up with the poetry of Ms. Dickinson (well, since my teens, at least, in the 1950's), I not sure her poems need the added distinction of music. Would the words of Shakespeare be any better sung? Besides, poetry needs time for reflection, often line by line, maybe word by word, and by turning Ms. Dickinson's poems into songs, we don't get that meditative opportunity (unless you're going to hit the pause button every few seconds). But I quibble. Of the song-poems presented, I preferred the ones set to music by Aaron Copland. They seemed the most musical and most evocative to me, perhaps because Copland was so used to staging ballet. By contrast, Jake Heggie's arrangements seem more energetic, with more pronounced, more dramatic accompaniments. Gordon Getty's take on some of the poems appears lighter than the others, but certainly appropriate--maybe the most appropriate of all considering the simplicity of the poems. However, he offers up the title poem, "There's a Certain Slant of Light," with a gravity, a seriousness, it deserves. The program ends with five poems by conductor-composer Michael Tilson Thomas, who affords them the most creative, most theatrical frameworks, with a hint of Leonard Bernstein thrown in. Certainly, there is variety here, with everyone doing his and her part in the proceedings with evident care. I just wish, as I said, I could have enjoyed the music as much as I admired it. Producers Job Maarse and Lisa Delan and engineers Jean-Marie Geijsen and Karel Bruggeman recorded the music at Friche la Belle de Mai, Marseille, France in June and July 2017. They made the album in hybrid SACD for multichannel and two-channel playback from an SACD player and two-channel playback from any ordinary CD player. As usual, I listened in two-channel SACD. Ms. Delan's voice sounds clear, if a tad strident in the highs, and well integrated with the orchestra--out in front but not excessively so, just realistically placed. The orchestral accompaniment is not too widely spaced behind her but again realistically, and it provides a good stage depth. The overall sonic picture is smooth and gentle, nicely complementing the music. 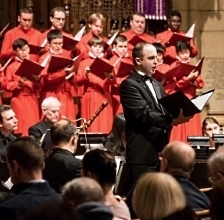 Concerts at Saint Thomas will host a special series of holiday programs this December, featuring their annual tradition of Handel's Messiah December 4 & 6, Britten's introspective A Ceremony of Carols December 13, and Messiaen's masterful organ cycle La Nativité du Seigneur December 22, performed on their newly inaugurated Miller-Scott Organ. In the year of his 60th birthday and almost a quarter century since his debut release, global classical music icon Andrea Bocelli has topped the U.S. Billboard 200 chart for the first time in his illustrious career with the release of 'Sì' (Decca/Sugar Music), his first album of new original material in 14 years. The album, released in the U.S. on October 26, through Universal Music Classics, part of Verve Label Group, sold 126,000 equivalent units in its first week to debut at #1 stateside and simultaneously topped the charts in the U.K. for the first time. One of the most universally loved and recognizable performers on the planet, Andrea Bocelli has sold in-excess of 90 million albums to date. His latest album 'Sì' has captivated audiences around the world and features Andrea collaborating with artists including Josh Groban, Dua Lipa, Russian soprano Aida Garifullina, Ed Sheeran and his 21-year-old son Matteo Bocelli. Uniquely for a classical artist, their duet together 'Fall on Me' has become a viral hit around the world with its music video garnering more than 21million views in just 5 weeks, while charting on streaming playlists globally. 'Fall on Me' also appears in the end credits of Disney's latest feature film 'The Nutcracker and The Four Realms' starring Keira Knightley, Mackenzie Foy, Helen Mirren and Morgan Freeman which debuted in theaters this week. 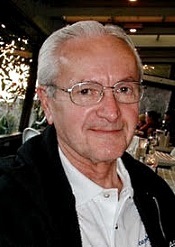 'Sì' was recorded at his home in Italy and produced by the legendary Bob Ezrin (Pink Floyd, Lou Reed, Alice Cooper, Deep Purple, Thirty Seconds To Mars). Naxos is happy to announce its acquisition of the Opus Arte label from the Royal Opera House. The acquisition marks an important step in the company's expansion of its audiovisual activities, as video is gaining importance in the classical music industry. The Naxos Music Group has been distributing the label worldwide almost since its launch in 1999. Opus Arte is one of the most important top-line international DVD and Blu-ray labels today, focused on opera, ballet and theatre. The acquisition includes an important catalogue of some 600 productions, many of which are also available for licensing for television and video on demand. While productions of the Royal Opera House are central to its activities, Opus Arte also regularly releases productions of its key partners, such as the Royal Shakespeare Company, The Globe and Glyndebourne. With the addition of the Opus Arte catalogue, the Naxos Music Group holds rights to some 1,600 audiovisual programmes and is now a major player in the business of performing arts on screen. Along with the acquisition of Opus Arte, the Naxos Music Group signed a long-term cooperation agreement with the Royal Opera House, giving Naxos the first option to distribute and market new and upcoming audiovisual recordings of opera and ballet performances from the Royal Opera House on DVD and Blu-ray, as well as to television, video on demand platforms and educational and other licensing partners. On Friday, December 14, 2018 at 8:00 p.m. at the Church of the Holy Trinity in Rittenhouse Square in Philadelphia, The Crossing gives its annual Christmas concert, The Crossing @ Christmas, presented by Annenberg Center Live. The concert is in memorial of Jeffrey Dinsmore, co-founder of The Crossing, and features an evening-length world premiere by Gavin Bryars, composer of The Fifth Century, for which The Crossing won the 2018 Grammy Award for Best Choral Performance. The Crossing @ Christmas will receive a special encore performance on Sunday, December 16 at 5:00 p.m. at The Crossing's home venue, The Presbyterian Church of Chestnut Hill. A pre-concert talk with conductor Donald Nally and composer Gavin Bryars takes place on Sunday at 4:00 pm in the Burleigh Cruikshank Memorial Chapel. For complete information, call (215) 898-3900 or visit annenbergcenter.org. Philharmonia Baroque Orchestra & Chorale will welcome guest conductor Patrick Dupré Quigley at their "Philharmonic Fire" program December 5-9. 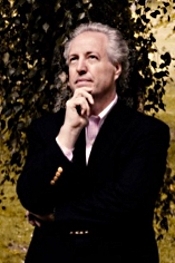 Currently the founder and artistic director of the Grammy-nominated ensemble Seraphic Fire, Quigley brings a passionate approach to scholarship and conducting with his program of Bach cantatas and vocal works by Monteverdi, Vivaldi, and Purcell. "The program features two sides of Bach's musical personality: the florid, Italianate Bach who studied the music of the Roman priest Antonio Vivaldi, and the firm, Lutheran Bach in the capitol of Saxony," says Quigley. The ASPECT Foundation for Music & Arts continues its third New York City season of illuminating performances on Wednesday, December 5, 2018 at 7:30pm with Mozart, Schumann & the Tales of Hoffmann at Bohemian National Hall. The program features Mozart's String Quintet No. 4 in G minor, K. 516 and Schumann's Piano Quintet in E flat major, Op. 44 performed by an ensemble of world-class musicians: violinists Philippe Quint and Grace Park, violists Matthew Lipman and Kyle Armbrust, cellist Zlatomir Fung, and pianist Vsevolod Dvorkin. Journalist and author Damian Fowler returns for an illustrated talk on writer E.T.A Hoffmann, about whom Schumann wrote "One hardly dares breathe when reading Hoffmann." Fowler discusses Hoffmann's influence on composers like Schumann, Brahms, and Mozart, having inspired ballets by Tchaikovsky (The Nutcracker) and Delibes (Coppélia), as well as operas by Offenbach, Busoni (Die Brautwahl) and Hindemith (Cardillac). His reach as a author, meanwhile, can be seen in the writings of Baudelaire, Balzac, Maupassant, Dostoevsky, Pushkin, Gogol, and Edgar Allan Poe. In New York on Saturday December 1st, Experiential Theater is thrilled to be bringing the "Nutcracker Dance Party" to the beautiful Bohemian National Hall, NYC. Be transported inside the story of Clara and her Nutcracker Prince. You'll have the opportunity to dance, drink and be merry at this fully interactive concert. Come at 3:30pm for a family friendly experience, and 7:30pm for Adults (with full bar). Take it from our audience last year, who were dancing to Tchaikovsky's ballet in a magical experience unlike anything else this holiday season! Did you attend our Nutcracker last year? If so, we'd love to hear from you! We're looking for any and all kinds of feedback, stories, even photos and videos if you have them. If you're willing to share your Nutcracker experience with us, please let us know. We might even feature you on a future post. Maestro Gustavo Dudamel's residency at Princeton University Concerts, in honor of our 125th anniversary, will launch on December 1-2, 2018. As outlined in the press release attached to this email, Maestro Dudamel's first visit to campus will include performances by Afro-Venezuelan folk singer Betsayda Machado, Quartet 212 from the Metropolitan Opera Orchestra with mezzo-soprano Emily D'Angelo, students from the El Sistema-inspired Boston String Academy, and two public discussions with Maestro Dudamel about Art, Education and Social Change: one with musicologist Don Michael Randel, and one with New York Philharmonic President & CEO Deborah Borda. "An Evening with Simone Dinnerstein"
Chanticleer Presents "A Chanticleer Christmas"
Chanticleer presents its beloved annual holiday tradition, "A Chanticleer Christmas," with eleven performances in venues across the San Francisco Bay Area, December 11 through 23. Chanticleer will present an offering of sacred music from the Renaissance to joyful spirituals and traditional carols in some of the Bay Area's most ornately decorated missions, churches and cathedrals. The program will be performed on eleven occasions at eight different venues throughout the Bay Area: Tuesday, December 11 at 8:00 p.m., First Congregational Church, Berkeley; Friday, December 14 at 6:00 p.m. and 8:30 p.m., St. Vincent Church, Petaluma; Saturday, December 15 at 8:00 p.m., St. Ignatius Church, San Francisco; Sunday, December 16 at 6:00 p.m, Cathedral of Christ the Light, Oakland; Tuesday, December 18 at 8:00 p.m., Cathedral of the Blessed Sacrament, Sacramento; Friday, December 21 at 6:00 p.m. & 8:30 p.m., Carmel Mission, Carmel; Saturday, December 22 at 6:00 p.m. & 8:30 p.m., Mission Santa Clara, Santa Clara; and Sunday, December 23 at 8:00 p.m., St. Ignatius Church, San Francisco. This season, Chanticleer will also present "A Very Special Chanticleer Christmas" as part of its Salon Series on Monday, December 10 at 7:00 p.m., Trinity & St. Peter's Church, San Francisco, featuring repertoire from "A Chanticleer Christmas," solo selections and music featuring the church's famed 1924 Skinner Organ. For further information, visit http://www.chanticleer.org. Mezzo-soprano J'Nai Bridges makes her highly-anticipated Weill Recital Hall at Carnegie Hall Debut on December 13 in a recital with pianist Mark Markham. The program showcases the breadth of her music-making with a mix of contemporary and core repertoire, from Danielpour to Mahler and Ravel, along with songs of faith and spirituals including works by Undine S. Moore and Margaret Bonds that she feels express her views as a woman of color living in America today. From March 28 through April 13, 2019, the Savannah Music Festival (SMF), Savannah, Georgia, celebrates its landmark 30th season with a stellar lineup of concerts, recitals, dance parties and events, and family-friendly performances in nine venues across Savannah's Historic District. From its origins as Savannah On Stage, SMF has grown to become one of the nation's leading multi-disciplinary musical arts events, distinguished by its commitment to innovative programming and known for attracting top-flight artists and audiences from across the country and overseas. A non-profit performing arts organization, the Savannah Music Festival (SMF) is dedicated to presenting world-class celebrations of the musical arts by creating timeless and adventurous productions that stimulate arts education, foster economic growth and unite artists and audiences in Savannah. In addition to year-round music education and broadcast initiatives, SMF produces one of the most distinctive cross-genre music festivals in the world. The 2019 festival marks the organization's 30th festival season and runs March 28 through April 13, including performances in venues throughout Savannah's historic district.